Tonight, the NASCAR Gander Outdoors Truck Series gets the race weekend going at Las Vegas Motor Speedway. The 1.5-mile oval in Las Vegas, Nevada hosts the Stratosphere 200. View the full 2019 Las Vegas truck race results below. Kyle Busch and Brett Moffitt will lead them to the starting line. 134 laps and three stages will make up the NASCAR truck race in Vegas. Green flag, Harrison Burton gives a push to Kyle Busch, they lead into turn one. They run three wide behind them. Friesen looks inside of Roper for 3rd. Roper shuts the door as Friesen was beyond the number on the door. All trucks continue, light damage to both trucks. Lap 6, Sheldon Creed is around off turn four! Creed got loose under Ryan Reed. The back end stepped out and he went around. Roper got into the back of Crafton as he checked up. The caution is out. Green, Kyle Busch leads on the inside line. Moffitt and Burton run door to door for 2nd. Several laps later, the side draft is finally effective, Moffitt is clear and takes over 2nd. 5 to go in stage 1, Kyle Busch leads Moffitt by 1.37 seconds. The field heads for the pit lane. Busch is first on and Friesen is first off. The top four trucks took two tires. Busch restarts in 6th. Trouble for Moffitt, the air hose get stuck under the tire. Green flag on stage two, Friesen gets the jump on the outside line. Rhodes side drafts off turn two, he takes the lead. Friesen side drafts him back to retake the lead. Lap 41, Busch is up to 3rd. Lap 50, Kyle Busch is up to 2nd. He’s closing on the bumper of the race leader. 8 to go, Friensen is holding Busch off. 7 to go, Friesen drives it deep intor turn three. He can;t hold it on the exit. He has to lift to avoid the wall off turn four. Busch drives by on the inside. Kyle Busch sweeps the race thus far, he wins stage two at Las Vegas Motor Speedway. That two tire call nearly worked for Friesen. The field heads to the pit lane. Busch is first to the pit entry and first off. Four tires for all. Green flag on stage three, busch gets the jump on the outside lane. Three wide behind him. Moffitt ends up four wide, he gets loose. Four wide at the line just outside the top 5. Ryan Reed gives a huge shove to Creed. That catapults him ahead of the group. Lap 74, the top five run nose to tail around the bottom. Moffitt has climbed to 3rd after the error on pit road. Lap 100, Kyle Busch leads Brett Moffitt by 2 seconds. 30 to go, green flag pit stops are underway. Ryan Reed gets the cycle started. 21 to go, Kyle Busch pits from the lead. 19 to go, Grant Enfinger leads Kyle Busch by 21 seconds. He’s yet to pit. 18 to go, Enfinger pits and passes the lead back to Kyle Busch. Busch leads by 1 second over Brett Moffitt. 15 to go, Kyle Busch struggles through lap traffic. Moffitt pulls to the deck lid. He’s there. The nose washes out and he chases it up the hill. 5 to go, Busch has opened the gap to Moffitt. Kyle Busch wins the NASCAR Truck Series race at Las Vegas Motor Speedway! 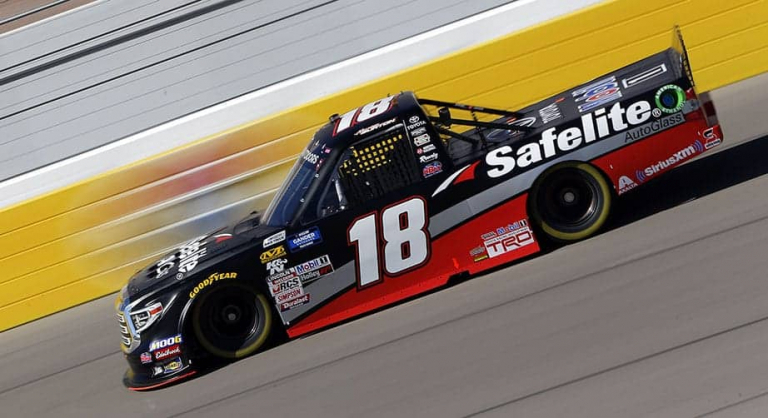 View NASCAR Gander Outdoors Truck Series race results from Las Vegas Motor Speedway below.